At the German Emigration Centre visitors get an idea of what flight and emigration mean for the individual. Furthermore, the museum in Bremerhaven makes emphatically clear that many Germans were forced to leave their homes. A large poster is emblazoned on the wooden facade of the German Emigration Centre in Bremerhaven, it reads “Dreams” – it calls on the visitors to view the stories that they will experience inside the centre not only as dramas, but also as new departures that incited people to follow their wildest dreams. And is it not true? Isn't leaving one's own country often the start of a new and better life? Aren't emigrants adventurers who have taken the courage to seek their fortune in a new and foreign place? Isn't emigration always about people going on a journey to find their dream? It is not quite as simple as that and the visitors find this out in the Emigration Centre. Germany's only Emigration Museum was opened in 2005 in the very port town from which around 7.2 million people started setting out for the “New World” from 1830. The Emigration Centre, with its striking, but not ostentatious, architecture, is located right where people gathered with a heavy heart to say goodbye before the big crossing. Emigration means turning one's back on one's home, severing one's roots and departing for an uncertain place far away. People who emigrate have to have strong reasons for doing this and these reasons usually have little to do with wanderlust or adventure. More with hardship, war, repression and political constraints. The Emigration Centre straightens people's perspectives and thus is particularly relevant today. The refugee issue is omnipresent, some Germans persistently voice their fear of foreigners supposedly infiltrating their country and see asylum seekers as a threat. This is why it is important to promote an awareness of why such people move from one country to another. Firstly, to make clear that emigration also entails a form of martyrdom. Secondly, to make people realise that throughout history emigration and flight not only affected “other people”, as some Europeans in their welfare states believe. Germany was also once a country of emigration, Germans were often dependent on the welcoming culture of others. Some people find this out from their own family trees at the Emigration Centre – there is a special section for family research, in which visitors can trace the paths their relations took on the computer. Emigration begins with farewell, and the experience at the museum gets this message across well. In a hall, the atmosphere of a November morning is created – the visitors gather on the dock in front of a steamer called the Lahn. The quay is bathed in the dim light of lanterns. There are luggage carts standing around, the ship starts groaning. And the faces of the wax figures, who the museum's designers have placed in the hall, are full of anxious expectation, pain, contemplation. This is the point when some of them actually changed their minds. What became of the emigrants in the “New World”? The Emigration Centre does not overload the visitors with impressions, it does not dramatise emigration. The exhibition takes a sober look at the voyages that changed people's lives dramatically. On the one hand, the museum makes the sailing experience come alive, by leading visitors into the belly of a sailing ship, in which the early generations of emigrants had to battle with seasickness, boredom, almost no food and lousy hygiene. On the other hand, it follows various individual fates closely. Each visitor is given an emigrant's biography in the form of a chip card which he uses at the various stations on his or her way through the exhibition to listen to what happened to the person. For example, the case of Erich Koch-Weser from Bremerhaven, a politician and member of the German Democratic Party (DDP) and Minister of the Interior and Justice during the Weimar Republic. He was forced to flee to Brazil after the Nazis seized power in 1933. 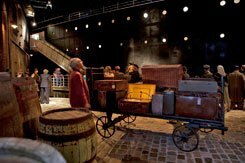 Visitors wandering through the Emigration Centre experience a silence interspersed with various sounds: the wind in the sails, people coughing in the dark, communal cabins, the signals of the steamer before departure. They look through portholes at the choppy sea, experience the darker side of the crossing – but also the bright side in the first-class section of the steamer. The building projects the mood of what it was like for the emigrants. And it conveys the emotional dimension of arrival and reorientation. Many of the newcomers to the economic wonderland of the USA ended up as labourers, leading an arduous life. Others made a career there. For example, Carl Laemmle, who set off as a 17-year-old from Bremerhaven to New York in 1884 and later became one of America's most successful film producers. It's an upsetting experience following the lives of the emigrants and empathising with their needs, hopes and their dreams, both unfulfilled and fulfilled. Inevitably the link to the refugee flows of today becomes obvious. Compared to those of the German emigrants of the past they are even more debilitating and desperate. And wouldn't it be wonderful, if one day peace would come to Syria, Eritrea or Afghanistan, so that there would also be museums in those countries with the word “Dreams” emblazoned on their facades. Thomas Hahn is the North-German correspondent of the “Süddeutsche Zeitung”. Copyright: Goethe-Institut, Thomas Hahn. This work is licensed under a Creative Commons Germany Attribution – NoDerivs 3.0 Germany license.